When I had first became aware of street art I thought immediately of graffiti culture, but its apparent that the culture of street art has grown past just the use of the aerosol medium. Instead some artists explore mediums that take on the 3d and interactive forms. I believe this has something to do with the reaction it garners from the viewer. The viewer is much more casual and isn't expecting to see a work of art on their way to work, school or whatever it may be. It's only the use of more abstract mediums may increase how the viewer reacts to the ambiguity of the art. The image above is by the street artist Joshua Allen Harris. He makes his sculptures from plastic trash bags. 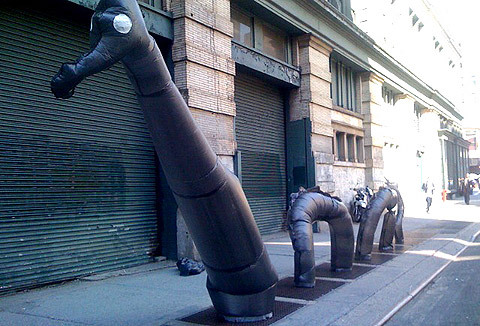 The sculptures are animated by the subway exhaust. It's interesting the way the sculptures are animated is solely dependent on the New York subway system. At times the Plastic bags are limp and other times they are fully erect towering over pedestrians. Like Blu, Joshua Allen Harris uses a medium that's not a traditionally synonymous with street art, but garners as much reaction as say a King Cope or a Banksy piece. The image above is by the artist known as Space Invader. 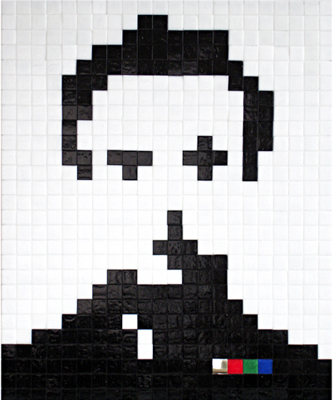 Space invader's subject matter is highly influenced by video games of the 80's and 90's. His artwork is normally assembled by means of mosaic tiles and plaster cement. These mosaic tiles give the sense that the artwork is a 8 bit graphic when in reality they are put together in a fashion that is much more traditional.These 8 bit portraits often standout on grunge filled underbellies of bridges or tucked away in alley ways. They attract attention with the use of bright colors contrasting against the muted urban grunge. 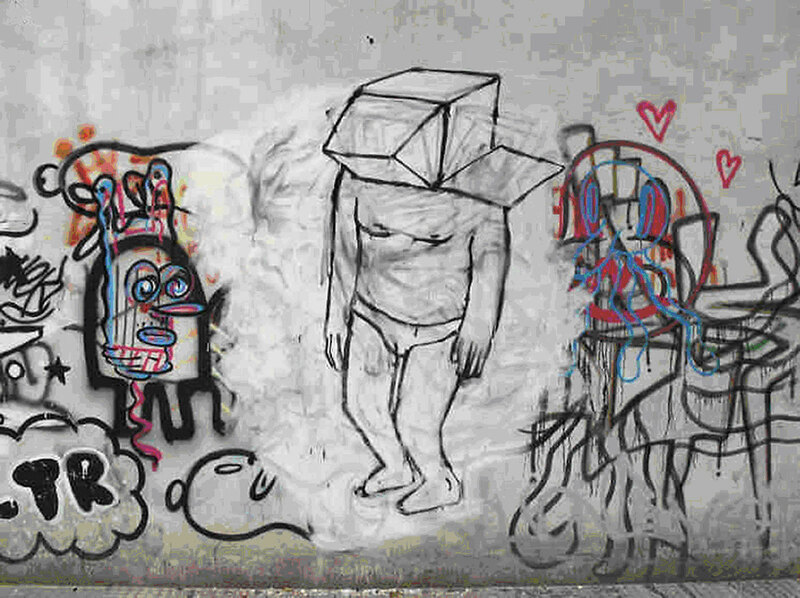 He says he creates these images because he feels hes not a vandal. Space Invader believes he is only offering an alternative to advertising. My assumption is that we are progressing into a age where we have been desensitized to things that just might only be on a 2d surface. These artist challenge the conventionality of art by using a medium that is more so household and doesn't necessarily hold a connotation of high art.